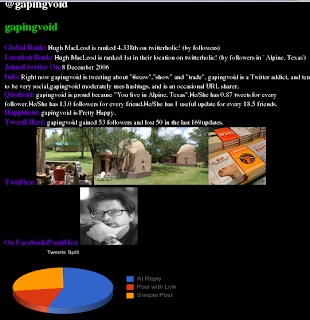 Recently I was looking on various sites that shows some statistics about tweeters (twitter user). They are great but they often focus on one thing, there is no single place where we can see all these analysis. So i closely analysed these websites to come-up with YQL hack to bring all of them on a single page. Mainly I focused myself on these websites. Well if I would have hosted this functionality something like this (actually hosted ). No one will use it, because people are very lazy. So I have created a chrome extension here. If you use chrome then you can simple see source code here. How to organize life using twitter?